Section One: Linked Routines. These are eight generic routines that are routined for maximum impact. I've added a couple twists to a couple of the effects, but the important lesson with Section One is one on routining. You will see a natural progression from one routine to the next. These routines are things which are considered old as the hills. But by adding a plot line that goes through each of the routines, I have come up with a powerful way of structuring these old workhorses. These are effects and/or plot-lines that don't flow from one to another, but instead are various effects and/or plot-lines that pack a punch all by themselves. This starts with "BLOT", a routine where you get credit for knowing a person's 4 digit PIN number, even though you only reveal one of the numbers. This is included as a thank-you bonus for people who buy "A Nite Of Dumb Poker". In the right hands, you will be creating a miracle. "Republocrat" is NOT an effect, but rather a plotline for an effect many of you probably already do or know some version thereof. This plotline is great anytime there is going to be an election. 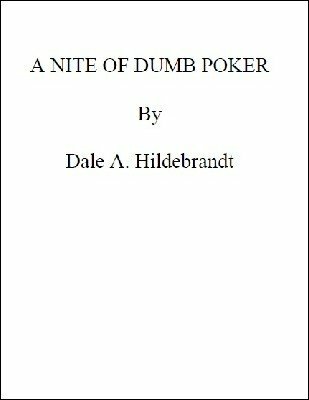 In "A Magician's Personal Hell", I provide you with a great plotline, but you will have to know how to perform the 21 Card Trick as it is not described in this manuscript. If you hate the 21 Card Trick, then you'll definitely sympathize with the main character in this plotline. "What're Triangles" uses linguistic deception to burn a thought of shape into a polaroid photo. You will have to have a certain Penn and Teller book in order to perform the routine. This is a masterful piece of dual reality and cueing. "Thought Cap" is a routine of mentalism with funny hats. Everybody wants a great mentalism routine, and everybody needs a funny hat. Learn about both with this routine. "Curse of Bank Night" is a take on Bank Night where nobody really loses, except for the magician who ends up on the wrong side of a curse. Finally, the sting is taken out of "Bank Night"!!! "Rental" allows you to predict a movie that your friend is going to rent. Perfect for a seemingly impromptu piece. "Autographs" is a routine involving an autograph book and a chosen card. This routine will have you drooling with the all its possibilities. "Two Writes" gives you 52 outs from a folded piece of paper. Learn how to construct a multiple-out from one piece of paper and a gimmick. "Non-Stick Tape" proves that you can hypnotically influence a person to not feel the stickiness of tape. That's right, the stickiness disappears and then reappears at your will. "Snow Job" is a beautifully constructed routine that you have to read to appreciate. A wonderful idea that gives a great twist on Coin In Bottle, without the bottle. "Diceography" is a routine centering around numbers and numerology. An effect taken to the next level. How soon will it be before you know you want this ebook? 1st edition 2007, 45 pages.